Register Log In Catsailor.com Forums Forums F16 Forum Viper Cunningham? 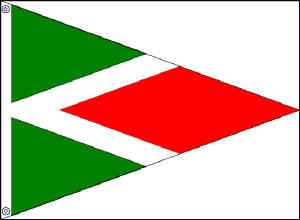 Could you Viper Drivers explain how your cunningham is run under the tramp and then up to the sail? I didn't get a close look at the GC but I heard they are very slick, easier to use and done on a 16-1 cascade system under the tramp? I have a nice diagram of it, I'll get it to you when I finally get home. You'll need a bit of space under your beam to set it up, but it is a real slick system. Thanks Brett, sorry I never got a break to come and talk with you, you were very popular and I couldn't find you when there were not so many girls around! Are you guys not even home yet? Wow, that's a road trip! Did your Mom make it back OK? And is it your brother that is a pilot, or is that you? Your Dad told me his son is a pilot but I wasn't sure. Take care and thanks for comming over, I hope you had fun. On a standard system the cleats of the cunningham are on the mast. On the Viper the cleats are on the front beam meaning all the loads on the sail are also on the mastpin on the front beam. Should a standard beam be re-inforced to do this? Here are some pictures from the Alinghi spy department! Nobody has replied and I'm surprised!!! Matt or someone else would be able to answer the above question better than me..
At least that's whtat I think! The Viper has a 4:1 purchase system betweent the sail and the bottom of the mast; you can see it in the 4th picture. The total system is a 16:1 and that means that the (single) blue line that goes up from the beam to the sail will only see 4 times the load that you pull on your downhaul line. Typically a human being does pull more then 50 kg; Therefor the force in the blue line is typically 200 kg or less while the total downhaul force on the sail may be around 800 kg's. A normal boat of F16 dimensions will quite easily see up to 1500 kg in mast step loads. Afterall the mainsheet tackle alone will already induce close to 400 kg of compression on the mast foot. 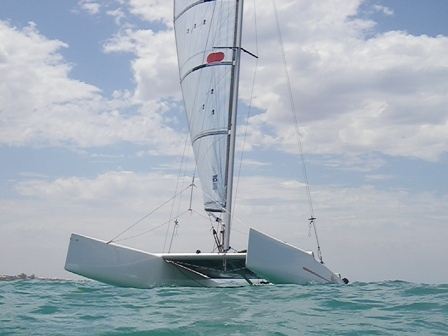 The forestay and sidestay add similar amounts to the total. Going up from say 1500 kg to 1700 kg (13%) is not a big deal at all. I think you just found the reason why your system sometimes hangs up ! Is the red line the spin retrieval line? If so, it is "trapped" by the blue downhaul along the beam(Pic#2)? Even if it is not completely trapped, you will have a sawing action between the 2 lines. Thanks for the pictures Andi, you Swiss spy! OK, given the complexity of all the blocks under the tramp, vs. in the mast, and the added loads to the beam, vs. all in the mast, is there an "easier" way to do a 16-1 inside the mast? What is in there allready, 8-1? I think I could stay with what I have (the stock Blade setup) and just add two blocks tied through my mainsail's tack (like the Viper), then add one to the bottom of the mast, and run it up-down-up down, that would increase the purchase quite a bit, yes? is there an "easier" way to do a 16-1 inside the mast? What is in there allready, 8-1? 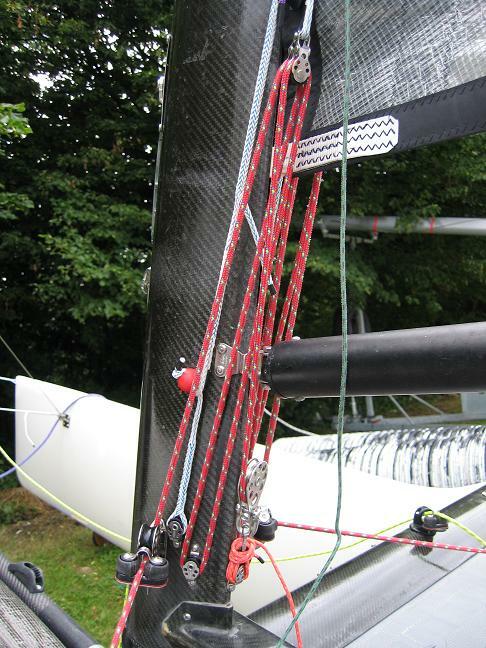 However you can upgrade this very easily to 8:1 (making 16:1 with the 2:1 outside of the mast). Open up the mast and replace the free hanging single block WITH becket (= 2nd stage) by a doubleblock. You'll end up with one loose end but you can tie that off at the bolt of L shaped plate up the mast. Close the mast up and DONE ! Dependents a little on the specific implementation in your mast but this shouldn't take more then 2 hours to complete while working slowly and carefully, double checking everything. Thanks Wouter! I'll get on it right away, and replace most of the old fat lines with dyneema while I'm at it. That stuff is the shiznet!!! BTW, buy a whole spool, it will save you a TON! I have a L plate up my mast as seen in the drawing, but I think you have bolt there. Want you want to do it replace the little block between the red and green lines with a double block and then tie the end that was secured to the single block off to the plate/bolt. I have two single block attached to the plate and so I would simply replace one of them by the single block WITH BECKET just I just removed from the setup. The becket will then be the perfect anchoring punt for the loose end of the red line. It will help alot if you have a clear picture of what you are looking for. It is a tight space, there up the mast. Last edited by Wouter; 11/20/09 03:03 PM. This is exactly what is in the mast except the plate at the top is secured with t thru bolt. To replace the blue line, just tape a new piece of line (23' of 5mm was original) to the old and pull through. To replace the red you need to remove the plate up high. Remove the bolt and pull a piece of thin line/kite string thru the mast with the plate still in place. Then with the mast base off you can pull the whole assembly out the base and check/replace any worn lines. Simply pull the kite string taught and the bracket will align back with the holes in the mast sides. You can not see these line to inspect, but I swap them out each year and they are in much better shape than any other exposed lines on the boat. They do not get worn and do not get sun beaten. It has been worth the trade off for a very little extra time to replace for me. Thanks for the info Matt, and the drawing Wouter, now, where does the red line dead-end? From the drawing it looks like the red goes back up to the hanging bracket or is it to a becket on the lower block? to a becket on the lower block. I installed this system early 2004 and I have never replaced any internals. One time my outside line (green line) got badly chaffed from rubbing against the gooseneck and I had to replace that. I thought it would be a good idea to take everything out and inspect it. It looked like new and all lines were still very flexible; they felt new as well. I use a 2 mm dyneema line for the second stage (red) to minimize friction; it has held up so far. Remember I leave my boat up on the beach for 6 months a year. Best downhaul setup I ever seen with respect to the combo of low maintaince and ease of use. Just like Matt I take out the blue line (swiftcord) each year and wash it clean again. The Green line I wrap up and store in my trampoline pocket away from sand and UV. Last edited by Wouter; 11/20/09 04:44 PM. Thanks for the diagram descriptions Wouter and Matt. I have been thinking of changing the downhaul system to an internal system just to maintain that clean look and feel. How do you line up and fix the internal bracket the blocks hang off?